In 1982, an extraordinary film - TRON- was released. Directed by Steven Lisberger, it has been a favorite of Your Emperor since its debut. 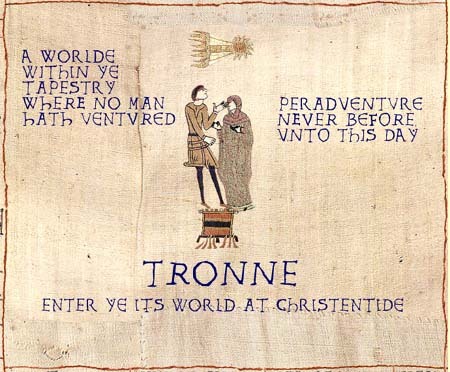 In an event thought to be connected to the recent invention of the Historic Tale Construction Kit, a series of tapestries illuminating some of the moments in the TRON storyline have been mysteriously made available here at the Empire of The Claw. No explanation for their existence - nor the fact that they are incomplete - has been offered. Nine individual tapestries have been revealed, beginning with what is thought to be a primitive version of the original TRON movie poster. Use the antediluvian navigation image below the tapestries to navigate throughout the exhibit. TRON and all related intellectual property elements are © The Walt Disney Corporation.